The occurrence of different types of vertebral disorders, generally termed spondylopathy are recently on the rise. Besides spondylitis, Cervical and lumbar spondylosis are two painful conditions, which are occurring due to the spinal degeneration and deformity of the joints of two or more vertebrae or due to thickening of periosteum, leading to the narrowing of the space between them causing compression of a nerve root emerging from the spinal cord, resulting in sensory system and motor system disturbances, such as severe pain in the neck, shoulder, arm, back and leg, accompanied by muscular weakness. 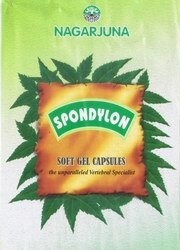 Spondylon soft gel capsule is an herbal remedy effective in cervical and lumbar spondylosis, ankylosing spondylosis and brachial neuralgia. The main ingredients are well known bebs effective in arresting inflammation, degeneration and the accompanying conditions, providing the required analgesic and rejuvenative actions. Ipomea tridentate- anti rheumatic, nervine tonic, and anti inflammatory. Phaseolus mungo- anti rheumatic, muscle tonic. Strobilanthes heynianus- anti inflammatory, anti arthritic. Asparagus racemosus- emollient, anti oxidant, immune stimulant, nervine tonic. Cedrus deodara- analgesic, anti inflammatory. Sida rhombifolia- anti inflammatory, febrifuge. Alpinia calcarata- anti inflammatory, anti rheumatic. Withania somnifera- anti oxidant, rejuvenative, aphrodisiac, analgesic. Ipomea paniculata- anti rheumatic, rejuvenates. Boerhaavia diffusa- immune modulator, diuretic. Tribulus terrestris- anti inflammatory, diuretic, analgesic, aphrodisiac. Piper chaba- anodyne, absorption enhancer. One or two capsules twice daily or as directed by the physician. A box of 10 strips of 10 soft gel capsules, thus totaling 100 capsules.